The political move by Atiku Abubakar from the APC to PDP ahead of the 2019 presidential election, might not pay him again after a new communique by PDP governors is released online. Ahead of the 2019 general elections, Governors elected on the platform of the Peoples Democratic Party (PDP) and the party's National Working Committee (NWC) on Sunday dumped former Vice President Abubakar Atiku who is warming up to run for President on the platform of the party come February 2019. 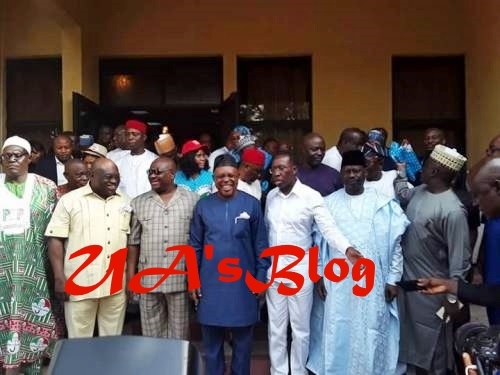 Eleven governors of the PDP, during a meeting at the Delta state governor's lodge in Asaba made the determination. The governors namely, Okezie Ikpeazu (Abia), Emmanuel Udom (Akwa Ibom), Henry Dickson (Bayelsa), Benedict Ayade (Cross River), Ifeanyi Okowa (Delta State), Dave Umahi (Ebonyi), Ayodele Fayose (Ekiti), Ifeanyi Ugwuanyi (Enugu), Ibrahim Hassan Dankwambo (Gombe), Nyesom Wike (Rivers), and Darius Ishaku (Taraba) together with the party's NWC led by the national chairman, Uche Secondus, were in Asaba for close door meeting to take a stand on the 2019 elections and examine the state of the nation. "The PDP Governors and the NWC after several hours of deliberation collectively agreed to settle for former governor of Jigawa state, Sule Lamido for his consistency since the party was founded. They viewed former Vice President Abubakar Atiku's moves as desperate and over ambitious. According to them, a true, faithful and loyal party man who has the interest of the party at heart will not turn into a political prostitute as the over-ambitious former Vice President Atiku has done," our source said. In a six-page communique signed by PDP national chairman, Uche Secondus and the Chairman, PDP Governors' Forum Nigeria, Ayo Fayose read by Mr. Secondus, at the end of the closed-door meeting the Governors and the party's NWC, strongly condemned what they called the "unabated killings" across the country and called on President Muhammadu Buhari to come out clean on the herdsmen killings and address the nation on how to end the carnage. "The President must take responsibility on the protection of lives and property of Nigerians which is the most important of his responsibilities. We believe that the Federal Government's decision to set up a Committee to address the issues of herdsmen killings is a pretentious approach to a matter that requires firm action and leadership by the President in line with his oath of office to protect all Nigerians irrespective of creed, tribe and political affiliation. "The People's Democratic Party (PDP) has been the author of restructuring and this was further expressed in the Report of the 2014 National Conference. The All Progressive Congress (APC) as a later day convert of restructuring is merely paying lip service to a matter of national importance. However, we have mandated our members in the National Assembly to immediately commence the process of initiating a Bill to address issues bothering on restructuring. "We urge Mr. President to henceforth direct the Economic and Financial Crimes Commission (EFCC) to adhere to the Rule of Law by obeying court judgements and orders such as the one involving the Ekiti State Government against EFCC and restrain itself from further political intimidation and harassment of known or perceived political opponents. We commend the judiciary for their commitment to the enthronement of constitutional democracy in the face of intimidation and harassment. "We condemn in strong terms the massive corruption going on in the management of fuel subsidy regime which the Federal Government had declared non-existent while billions of Naira are being deducted monthly at Federation Accounts Allocation Committee (FAAC) meetings. The PDP states and local governments are vehemently opposed to the unilateral withdrawal of $1 billion from the Excess Crude Account by the Federal Government under any guise. "We commend members of our party for their unalloyed support. We reiterate that our repositioned party is prepared for the 2019 elections and will ensure that all Nigerians aspiring to elective offices are free to contest on the platform of the PDP. We want to assure that no established organ of the party is allowed to align with any presidential aspirant. We thank the people and government of Delta State for playing host to this all-important meeting." the communiqué stated. Journalists who kept night vigil waiting for the outcome of the meeting between the PDP Governors and the NWC, however, observed that the eleven governors have had a three hours close door meeting at governor Ifeanyi Okowa's lodge in the government house, Asaba where series of decisions had been taken by the Governors' Forum before the commencement of the enlarged governors and party NWC closed-door meeting. Earlier, before the closed-door meeting the National Chairman of the Peoples Democratic Party (PDP), Uche Secondus who was addressing leaders, elders and members of the PDP at the Unity hall government house, Asaba, discredited former President Olusegun Obasanjo's newly formed Coalition for Nigerian Movement (CNM), saying it is dead on arrival, adding that the All Progressive Congress (APC) failure to provide good governance will be a yardstick for Nigerians to vote for candidates of the PDP in the 2019 general elections.